Well that's Christmas over for another year. Hope you all had a good one and didn't succumb to any of the bugs that seem to be around. 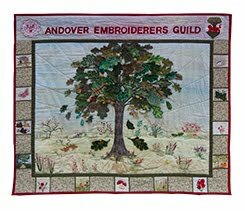 Thanks to Joy and Nicky we have an exciting programme for 2013, starting with Rebecca Bissonet's talk about how she progressed from being an apprentice to a fully fledged professional embroiderer. Nicky will be taking bookings for the February workshop with mixed-media artist Deborah Vallance. All the details are on the posters below.